A Dan Kiley designed landscape without trees or water features is a sad sight. 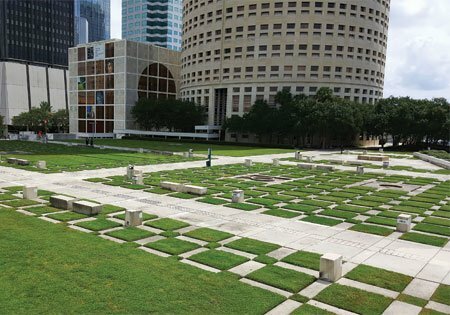 Yet, the Tampa garden that now bears the name of landscape architect, Dan Urban Kiley, is just that. Dan Kiley was the leading American modernist landscape architects working in the postwar period, known for his work on the Lincoln Center plaza, Fountain Plaza in Dallas, Miller house garden and US Air Force campus garden designs. In 1988 Kiley was invited to work on the North Carolina National Bank plaza in Tampa, later known as NationsBank. Landscape architect Dan Kiley and architect Harry Wolf worked together to provide a harmonious plan for the NCNB headquarters building and the surrounding plaza. The design was based on the fibonacci mathematical sequence. Kiley used the sequence to determine the plaza’s checkerboard pattern of grass, concrete panels, and water features. Tree types and placement were based on height in relation to the fibonacci sequence. The tower and plaza opened in 1988, and the plaza was quickly praised as one of Kiley’s master works. The NationsBank tower designed by Harry Wolf is one of the most iconic structures in Tampa.